BELUGA is an installation that transforms our experience of human interaction into another mode – one of visible light and movement. 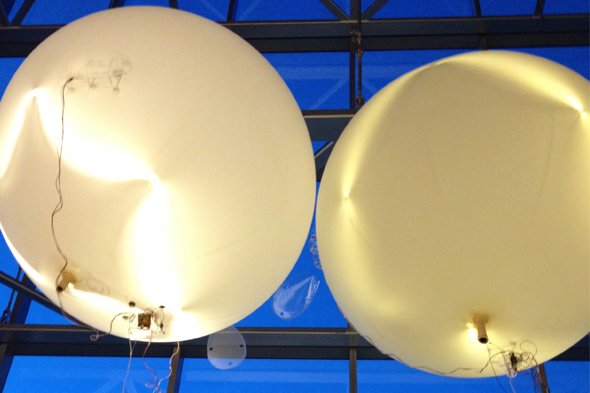 The Belugas are winged blimps suspended in space, which, through the use of embedded audio sensors, are aware of people’s conversations and each other. They are designed to behave and react in specific ways; as people talk, the Belugas illuminate and glow then try and flap towards towards the conversation. But, if the tone of the conversation changes as people get louder or they start to argue, the Belugas will respond by rapidly flickering their lights and trying to fly in an even more erratic and wonky manner. Talking softly to the Belugas calms and relaxes them, allowing them to resume their gentle illumination and aerial interaction with human and machine companions. Antony Nevin is a multimedia interactive arts designer who investigates ways that participatory installations act as mediating devices for social interaction. His current research explores how these installations can playfully transform people’s emotional response to their surroundings through making what seem familiar, strange. He has exhibited his work internationally and nationally including in 2012 ISEA (USA), IDEA (Australia), International Balloon Fiesta (US) and Fab8 (NZ). In 2011 WngtnLUX . In 2009 the Lightwave Festival, Ireland and Nordes: Engaging Artefacts, Oslo. He has also written about design and medicine for The Australasian Medical Journal.